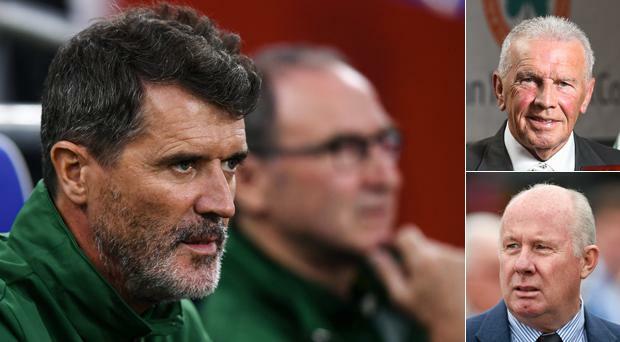 Irish football legends John Giles and Liam Brady have called on FAI chief executive John Delaney and Martin O'Neill to act after details of Roy Keane's row with Harry Arter were revealed. Details of Keane's expletive-laden attack on the Cardiff City midfielder have emerged over the past 24 hours. The Sunday World reported yesterday that during his tirade, Keane called Arter "a w***ker and a p***k" and suggested he did not rate him as a player and would not pick him if he was Ireland manager. Arter subsequently spoke to O'Neill and said he would not be making himself available for selection in light of the row. Speaking on Eamon Dunphy's podcast The Stand, Giles said that Keane had overstepped his mark and questioned his ability to perform the role of assistant manager. "I knew there was a row. I didn't know what the details were," he said. "It shouldn't happen. Roy Keane is assistant manager of the Irish team and he is there to assist the manager. This type of thing shouldn't happen at the best of times. "Martin was in the paper yesterday, he was going back on Roy's career where he was shouting at (Paul) Scholes and drove on Manchester United and this is a bit of apples and oranges to be quite honest. That's when Keane was a player on the pitch, he was entitled to do that. He's assistant manager now, he's not a player. "Players who are really injured, unless they are kidding on, need a lot of sympathy and a lot of help. We've all been injured as footballers and there is nothing worse. "In Arter's case, if Martin O'Neill felt Arter was kidding on then he shouldn't be picked. If he's not he needs sympathy and support. "This is nonsense. This is very, very serious stuff. Morale in a football team is very fragile and the rest of players would have known exactly what happened and that doesn't help the spirit of the team. "As assistant manager he should be helping Martin and in the Arter case he hasn't helped him at all. In fact, Arter has said he doesn't want to play, That's being destructive. "Is he equipped to be an assistant manager? Definitely not." Brady feels that O'Neill and the FAI need to step in. "The thing that has struck me about Roy Keane and it has for years is that I don't think he likes football and I don't think he likes players," he said. You worked with him (directed at Dunphy) when you did his book a good few years ago and I read that book. What came across for me when I read it was 'I don't have any friends in the game', 'I don't associate myself with other players', which is difficult for someone like me to understand because most of the best memories about my career are about lads I met and the lads I enjoyed along the way. I still have really strong friendships with a lot of the players. "When you hear him speak about football in his punditry role. It comes across that he doesn't like modern day footballers. "I think this thing is boiling inside of him and if he gets an idea in his head where Harry Arter pulls out of training because he doesn't fancy it, he can fly off (the handle) as he did. You can't do that anymore. "You couldn't do it in any day as an assistant manager. "He's damaging a squad that's weak in many ways anyway and we can't afford to lose any players. "Every time there is an international match there was a story about Roy Keane, whether he was having a go at somebody or whether he was launching another book of his. "I can't understand how Martin O'Neill could put up with that. He's got an international match and Roy Keane decides to launch his book on the week of an international game. It's crazy... mind boggling and it's really taking the piss, isn't it? "Martin O'Neill, or the powers that be... John Delaney has to say enough of this. This has got to stop."